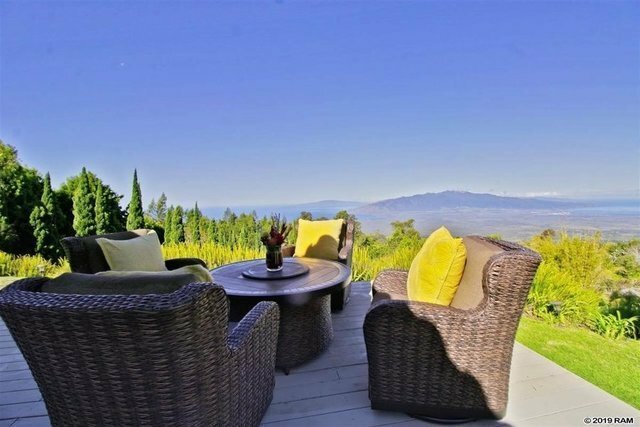 Nestled on 2 acres sits an enticing and wonderful jewel on the top of Kula Nani Subdivision overlooking the entire Valley Isle and the spectacular West Maui Mountains shore to shore. Surrounded by the breathtaking view and extensive landscaping of proteas, herb and flowering gardens and tall trees stand a distinguished single level home of 3 en-suite bedrooms. Designed with quality construction and well-executed architecture of a single level home. Enter through the custom dual tall mahogany front doors into a welcoming foray of blue rock and warmth which seamlessly blends into a grand open floor plan of 23 ft ceilings. Relax, breathe surrounded by nature, some of the worlds greatest views, strong Italian travertine flooring, tall Pella windows, and sliding doors, two zone home temperature controls, and a very recently remodeled kitchen fit for the sophistication of both the cuisinier and the cuisinire. Indulge in Italian Quartzite counters top, Acacia cabinetry, Bosch dishwasher, Wolfe Induction Cook-top and double ovens, Subzero wine keeper and new Kitchen Aid refrigerator are present to serve the best of evenings at a home serving spectacular sunset, star gazing indoors or out, take pleasure in views past Lanai, Molokai and the finest westward views of Maui. What to do with the company? They can stay in the family and friends sweet and independent spacious apartment above the garage.